PLP App - Not used in this series. Cutting will be monitored on replay and penalties issued for excessive cutting. These things have DRS, but I'm not sure how accurate that is implemented in the game. Could do with a setup if anyone has a decent one. The medium tyres seem to instantly have too much air in them with the default setup by +3 to 4 psi strange! Got no benchmark times to compare against but still to learn the track and car combo. Mmm I had a Windows update mess up my screen resolution and I havent been able to fix it yet. Don't count on me racing this one unfortunately as I don't have the time to get behind the pc again until Wednesday evening. Posted a tweaked setup from the market on stracker. Car rotates very well with that one, maybe too well, so might want to tone that down a bit, but it's easier that way than the other way around IMO. Ah damn just read this after my brief practise sesh. Thanks Jeff will try it out tomorrow eve. Finally had someone else on the practice server to trade lap times with (fmg) and was good fun for half hour beating each other’s times . Improved by 3 secs. 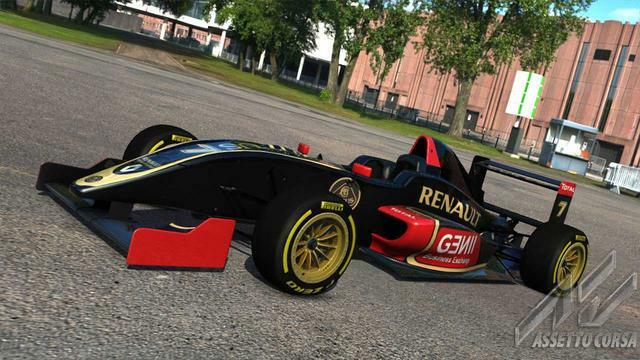 Do you guys want me to make an entry list with the F1 skins in the opening post? If you do and you want a certain skin, let me know, otherwise you'll get a random skin. If nobody downloaded that pack, I won't bother as people will just see the same stock skins. ps, only noticed a few mins before the start that it was a 40minute race. We really don't need it that long for a test race and small turnouts. Hadnt done any practise so picked up Jeffs setup and just kept putting laps on it. decided to drop the front ARB a few clicks to help on turn in. Was expecting to circulate on my own but decided to try and concentrate as both Mark and FMG dropped back. Decided to leave once FMG came past, but he caught me on a really rubbish lap, almost losing it in the first corner so wasn't going to fight things too much. What DRS rules are you used in Q and race, guys? As i remember, it is not possible to disable DRS from server side? Just use whenever. Like you say, it can't be regulated, so making it used realistically is impossible. So what's the point of the DRS boards some tracks have? Just cosmetic? Page created in 0.113 seconds with 49 queries.